AFTER years of deliberation, the ASEAN Economic Community (AEC) is now a reality, and with English recognized as the economic bloc’s official language, demand for high quality English language education is expected to boost the region’s international school sector. This demand has made Asia the largest market for international education with 2.4 million students and 4,181 international schools, which make up 55 percent of the global international school market. Some reports predict the Asia-Pacific region will have as many as 7,000 international schools catering for more than 5 million students by 2024. Southeast Asia is currently home to over 800 international schools which cater for over 300,000 students and, as more parents realise the opportunities the AEC offers graduates with high English language proficiency, the region is set to experience increasing demand. While the opening of the AEC is stimulating demand for English language education, most parents are looking for international schools to prepare their children for opportunities in higher education beyond the AEC. As the director ofVaree International School, Varee Patravanich, explains, “the opening of our international kindergarten and international primary school coincides with the opening of the AEC but we are focused on preparing our students for the educational and economic opportunities beyond ASEAN, attending university in Europe or North America is a goal for most of our students”. Over the coming years growth of the AEC’s international school sector is set to be extremely uneven as some governments support and encourage the development of international schools while other nations have laws which hinder access and growth. Malaysia, which has 142 international schools, is the ASEAN nation which has most proactively encouraged the growth of international education. Previous restrictions on local students’ eligibility to enroll at international schools have all been lifted andgovernment incentives, which include five-year 70 percent income tax exemption for new international schools, are encouraging foreign school owners. In Indonesia, strong economic growth and a surging middle class has helped double the international school market over the past decade. Indonesia now has 190 schools, and with a population of 250 million there is ample opportunity for further growth. However, there are concerns that the tightening of nationalist policies, which have seen the country’s international schools scrambling to meet rapidly changing legislation, could be counterproductive. In 2014 a number of new regulationsforced international schools in Indonesia to adapt their curricula to ensure all students were taught a cultural studies curricula which focused heavily on Indonesian religion, culture and language. Regulations also prohibit international schools from being fully owned by foreigners and the school board must be able to prove that it has sufficient capital to run the school for the next six years. Furthermore, in 2014 international schools had to remove the term ‘international’ from their name – this forced the British International School to become the British School Jakarta, the Australian International School to become the Australian Independent School and the Jakarta International School to become the Jakarta Intercultural School. Thailand also has a buoyant international education sector. According to ISC Research there are 176 international schools in Thailand and over 65,000 international school students. 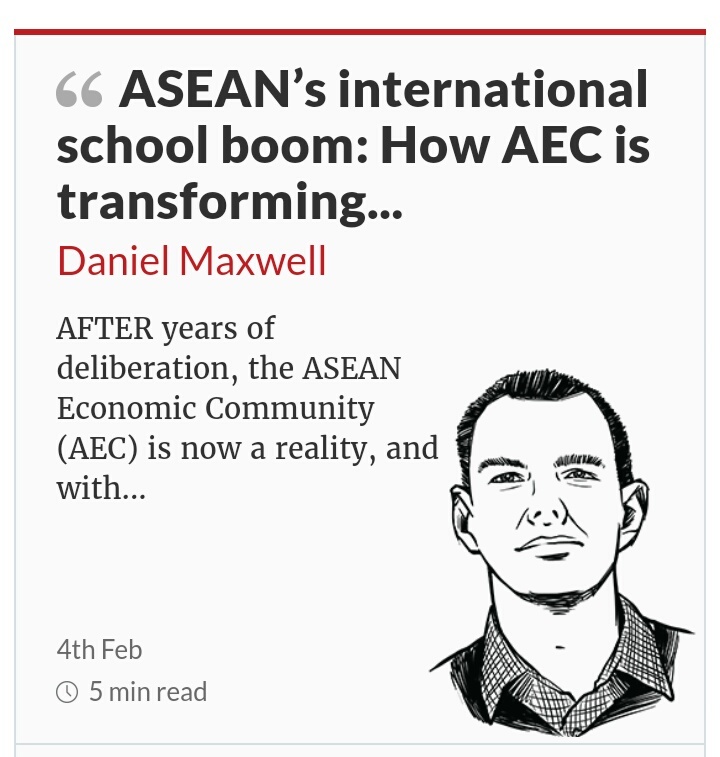 Since the mid-1990s, when Thailand relaxed its restrictions on local students attending international schools, the country has seen strong and steady growth in this sector and this looks set to continue with the opening of the AEC. The success of international schooling in Thailand has raised hopes that the country could become the AEC’s international education hub, but achieving this will require vision, insight and commitment from the country’s leadership. Singapore, like a number of East Asian nations such as Japan, South Korea and Taiwan, has strict regulations restricting local students from enrolling in international schools. This leaves the international school sector to rely entirely on the city-state’s large expatriate population. Currently, Singapore is home to 83 international schools and almost 60,000 international students. Singapore’s leaders envision more demand for international schools over the coming years and the Economic Development Board (EDB), which controls the land zoned for international school use, is releasing new sites with 30-year leases. In Vietnam, there are restrictions on the number of local children that can enroll at any one international school. These restrictions limit the amount of local students at international schools to 5 percent in primary schools and 20 percent in high schools. These limits have created intense demand of the few places available in each school and the sector’s growth will continue to be hindered until government restrictions are lifted. Solid English language proficiency in the Philippines, which, across Asia, is only surpassed by Singapore and India, has lessened parents’ demand for international schools. At present there are 45 international schools across the Philippines and this figure is unlikely to grow much in the near future. Burma (Myanmar) presents interesting opportunities as it transforms from a military dictatorship. There are currently just 33 international schools in the country, leaving the sector with huge potential for growth over the long term. The AEC’s powerful northern neighbour, China, with a student population of 400 million, is providing an additional boost to the region’s international education sector, as Chinese parents increasingly recognize the flaws of a basic education system built on rote learning. China’s one-child policy has encouraged Chinese parents to invest heavily in their children’s education but legal restrictions on local students attending international schools block these children from an international education. Denied access to international schooling in their home country, many students are now travelling abroad to study and while the U.K. and the U.S. remain the favoured destinations of China’s most affluent, an increasing number of middle class parents are realizing the benefits of international schools closer to home, with Thailand, Malaysia and Singapore becoming popular destinations for young Chinese learners.